How can I do the same operations on many different values? Correctly write for loops to repeat simple calculations. Trace changes to a loop variable as the loop runs. Trace changes to other variables as they are updated by a for loop. We have a dozen data sets right now, though, and more on the way. We want to create plots for all of our data sets with a single statement. To do that, we’ll have to teach the computer how to repeat things. An example task that we might want to repeat is printing each character in a word on a line of its own. Not scalable. Imagine you need to print characters of a string that is hundreds of letters long. It might be easier just to type them in manually. Difficult to maintain. If we want to decorate each printed character with an asterix or any other character, we would have to change four lines of code. While this might not be a problem for short strings, it would definitely be a problem for longer ones. Fragile. If we use it with a word that has more characters than what we initially envisioned, it will only display part of the word’s characters. A shorter string, on the other hand, will cause an error because it will be trying to display part of the string that don’t exist. 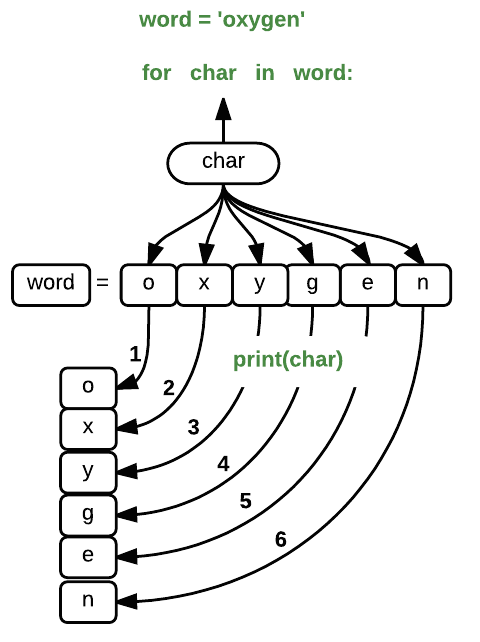 where each character (char) in the variable word is looped through and printed one character after another. The numbers in the diagram denote which loop cycle the character was printed in (1 being the first loop, and 6 being the final loop). We can call the loop variable anything we like, but there must be a colon at the end of the line starting the loop, and we must indent anything we want to run inside the loop. Unlike many other languages, there is no command to signify the end of the loop body (e.g. end for); what is indented after the for statement belongs to the loop. It is a good idea to choose variable names that are meaningful, otherwise it would be more difficult to understand what the loop is doing. It’s worth tracing the execution of this little program step by step. Since there are five characters in 'aeiou', the statement on line 3 will be executed five times. The first time around, length is zero (the value assigned to it on line 1) and vowel is 'a'. The statement adds 1 to the old value of length, producing 1, and updates length to refer to that new value. The next time around, vowel is 'e' and length is 1, so length is updated to be 2. After three more updates, length is 5; since there is nothing left in 'aeiou' for Python to process, the loop finishes and the print statement on line 4 tells us our final answer. len is much faster than any function we could write ourselves, and much easier to read than a two-line loop; it will also give us the length of many other things that we haven’t met yet, so we should always use it when we can. Python has a built-in function called range that generates a sequence of numbers. range can accept 1, 2, or 3 parameters. If one parameter is given, range generates a sequence of that length, starting at zero and incrementing by 1. For example, range(3) produces the numbers 0, 1, 2. How many times is the body of the loop executed? The body of the loop is executed 6 times. Write a loop that calculates the same result as 5 ** 3 using multiplication (and without exponentiation). Knowing that two strings can be concatenated using the + operator, write a loop that takes a string and produces a new string with the characters in reverse order, so 'Newton' becomes 'notweN'. The code above loops through xs, assigning the index to i and the value to x. Suppose you have encoded a polynomial as a list of coefficients in the following way: the first element is the constant term, the second element is the coefficient of the linear term, the third is the coefficient of the quadratic term, etc. Write a loop using enumerate(cc) which computes the value y of any polynomial, given x and cc.